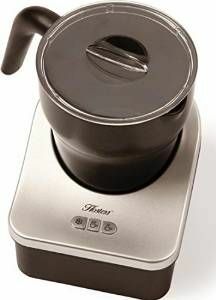 The Hostess Milk Frother has 3 temperature settings, 2 heat and 1 cold. You can froth milk for cappuccinnos, lattes, make wonderful hot chocolate drinks and even heat up your favourite soup. The jug and lid are dishwasher safe making it easy to clean. The jug is suitable for left or right handed use and has a non stick surface.